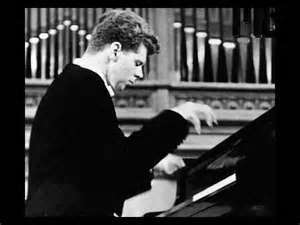 On Wednesday Feb. 27, 2013 virtuoso classical pianist Van Cliburn died after a valiant fight with bone cancer. This from NPR: "Legendary pianist Van Cliburn, the only solo musician of any genre to receive a ticker-tape parade in New York City and the first classical musician to sell a million albums, died Wednesday morning in his Fort Worth, Texas, home. The 78-year-old Texan soared to world fame in 1958 when he won the first International Tchaikovsky Competition in Moscow, at the height of the Cold War."